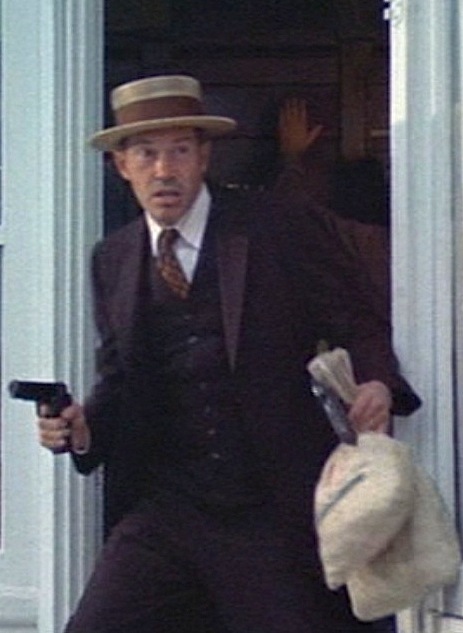 Warren Oates as master bank robber John Dillinger in 1973’s Dillinger. By March 1934, John Dillinger had well-established himself as a national criminal hero. He made a mockery of both hated bankers and inept police and, best of all, he kept getting away with it. Sure, he wasn’t the only beloved “Public Enemy” in the national scene, but “Baby Face” Nelson was too violent, Bonnie and Clyde were too incompetent, and no one had heard from “Pretty Boy” Floyd in almost a year. This was the highest point of Dillinger’s criminal career. He had made fools of the police with his escape from Crown Point, Indiana’s jail, he was taking down major bank scores across the Midwest with fellow gangsters Nelson, Homer Van Meter, and “Red” Hamilton, and he was doing it all with his beloved moll at his side, Billie Frechette. The 1973 biopic Dillinger covers this era in Dillinger history with excellent enthusiasm, using a montage of set photographs, newspaper clippings, and historical footage all set to a stomping country guitar and harmonica song, known as “One Last Time” on the rare but worthwhile soundtrack album. The gang goes from bank to bank, grabbing loot and chopping down every cop in their way. In real life, the bank jobs were much fewer. Dillinger and Nelson’s gang took a score in Sioux Falls, South Dakota for just under $50,000. The best part? It was three days after his dramatic escape from prison. A week later, they were in Mason City, Iowa, scooping up cash. This robbery was a little more violent than usual, with Dillinger, Hamilton, and two bystanders all receiving gunshot wounds during a getaway skirmish. However, the getaway was clean and the rest of the month was complete with visits to family and new apartments. The real Dillinger, all smiles in March 1934. Within a month, Dillinger would be shot (again!) in the leg, he would watch his girlfriend taken into federal custody, and – worst of all – he would be completely out of bank jobs. After this, what Henry Hill in Goodfellas would call “the bad time”, the gang split for safety reasons. Dillinger and Hamilton paired off and spent a few weeks hiding out before agreeing to meet up with the rest of the gang at a resort known as Little Bohemia in Manitowish, Wisconsin on April 22nd. The next night, the FBI raided and the gang split. It wasn’t a bloodless raid, with the federal boys killing an innocent man and Nelson fatally wounding FBI agent Carter Baum, but the total toll of two killed and four wounded comes nowhere near the carnage in Milius’s film. The feds at first thought it was a success… until they realized they lost one of their number and only captured three Dillinger gang girlfriends. The entire gang got away. So what are the major differences from the real life incident to film? Both Dillinger and Public Enemies show Little Bohemia as a refuge after a bank robbery gone awry. In Dillinger, it is the Mason City job; in Public Enemies, it is the initial Sioux Falls job. Both films have a gang member’s injury require the necessity of a quick hideout. Dillinger picks on an unnamed gang member – probably meant to be Tommy Carroll. Public Enemies had Dillinger getting winged in the shoulder (as he was in Mason City) as well as having poor Carroll receive a fatal head wound. So the gang gets to Little Bohemia, which Dillinger incorrectly portrays as the gang’s regular hideout when, in fact, they had never been there before. In real life, since it was a low stress vacation, they played cards and plinked around with guns in the back. Dillinger had a brief confrontation with the resort owner, Emil Wanatka, and told him to keep his mouth shut. Wanatka did, but his wife didn’t, and word was eventually given to the FBI that the Dillinger gang was hiding out in the north woods of Wisconsin. In both Dillinger and Public Enemies, the gang recuperates and is unknowingly interrupted by the tipped-off FBI; in Dillinger, a homeless man discovers a bullet-stricken car parked out front; in Public Enemies, a dying Tommy Carroll gave the feds the location. Either way, the federal agents close in under the cover of night. In real life (and in Public Enemies), the nervous agents immediately began their raid by shooting at three men who were leaving the resort. Unfortunately, the men were workers from a local camp. Innocent guys. The gang was tipped off. They fired back and, as the feds took cover, they ran. Dillinger turns the brief firefight into an epic showdown between gangsters and police that leaves most of both sides dead. Milius also wisely had his agents wait until the next morning to fight. Sure, it was inaccurate, but it shows up much better given the film’s budget and gives us the hilarious image of Richard Dreyfuss in a robe and bulletproof vest, shouting “Eat it, G-men!” as he fires his Thompson. Both films show Little Bohemia as the beginning of the end. The immediate end. The gang is soon rounded up and killed. Dillinger sticks more to fact here, having each gang member’s death parallel the way they had actually died in real life (albeit a few months later). Public Enemies just killed them all in a car with Super Agent Purvis finishing them off. In real life, the gang managed to get back together for one last job in South Bend, Indiana. This turned into a gunfight – a very bad one with fatalities – that likely provided the basis for the deadly pre-Little Bohemia bank robberies in Dillinger and Public Enemies. After this, they scattered and were killed off one by one – Dillinger, Van Meter, Floyd, and Nelson. For the Mason City bank job, Dillinger wears a dark brown wool three-piece suit. At first, I wondered if the vest was actually a black bulletproof vest like some of the other gang members wear, but turning up the exposure proves that it is, indeed, a three-piece suit. The coat is single-breasted with moderately-sized notch lapels. It closes in the front with two buttons and has two buttons on each cuff as well. There are flapped hip pockets but no breast pocket. The jacket has a generous fit and a ventless back. I wonder if Dillinger himself ever looked as bank robber-y as Warren Oates does here. Dillinger’s high-fastening vest has seven buttons down the front and four buttons – two on each side. Dillinger wears all seven buttons fastened, causing the vest’s front to bunch up in some scenes and make his belly look comically large. He wears it for the robbery but removes it for his escape the next day. The suit’s flat front trousers have a medium rise and plain-hemmed bottoms. 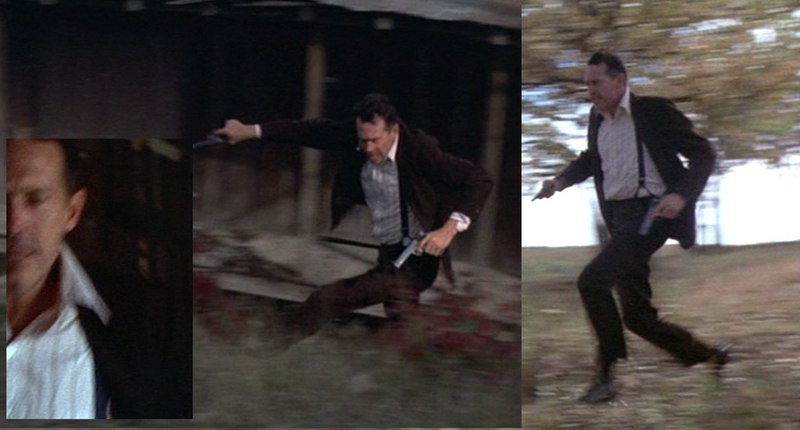 There are definitely side pockets, seen when Dillinger is running through the woods to escape Little Bohemia. The trousers are worn with a pair of dark blue suspenders. They attach to the trouser waistband with dark brown leather hardware. Dillinger’s suspenders are best seen when he is escaping Little Bohemia. The inset photo (bottom left) shows that the suspenders are actually blue. This makes sense, as suspenders are meant to be pretty hidden when worn with a three-piece suit. While a lot of the cheaper Depression-era flicks just thought, “Hey, people in the ’70s are wearing three-piece suits! Let’s use one of those!”, the costume and wardrobe folks (James M. George and Barbara Siebert) made sure that the gang looked as 1930s as they could on the film’s budget. Sure, there are some flubs – most notably the extremely 1973 sportswear seen in the shop window behind Purvis during the Chicago finale – but, all in all, they did a fine job. Dillinger’s shirt is the only part of his wardrobe with a ’70s vibe. It is white with dark brown stripes. The front has a placket and no pocket. Dillinger keeps the barrel cuffs buttoned. The large spread collars give the shirt away as a 1970s piece, but not to the suit’s detriment. Dillinger proves that bank robbers may look badass but also have pretty tacky taste in wallpaper. During the robbery, Dillinger wears a brown patterned tie that he ditches for the Little Bohemia getaway. His shoes are a pair of black leather plain toe bluchers with black laces. He definitely wears dark brown socks with the shoes while at Little Bohemia but appears to have black socks on during the bank robbery. I guess a situation like that would cause your feet to sweat a lot, so Dillinger wisely changed his socks. The sartorially correct socks would indeed be the dark brown ones, with the idea being that the pant leg effortlessly transitions to the shoe. 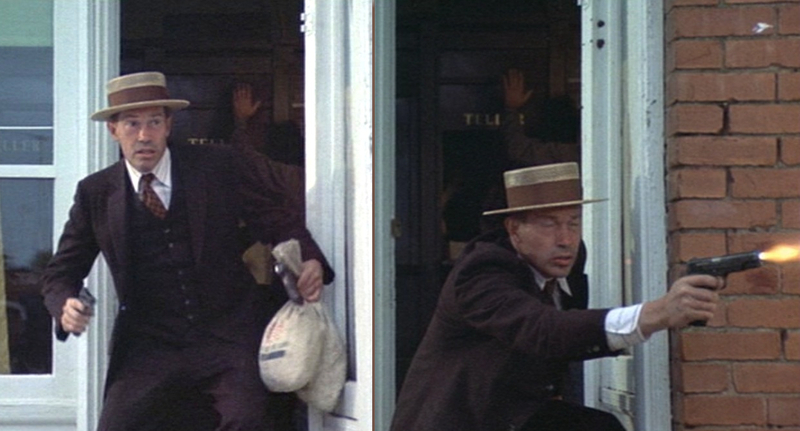 (Left) Carroll, Floyd, and Dillinger shoot their way out of a bank robbery. (Right) Dillinger, now on his own. The socks might be up in the air, but he definitely changes his hat from bank robbery to getaway. In Mason City, Dillinger wears a dirty stiff straw boater with a wide brown band. After the Little Bohemia shootout and the wipeout of his gang, he takes to the road in a stolen Ford and visits his family’s homestead in Indiana. Here, he is wearing a brown fedora with a brown band. 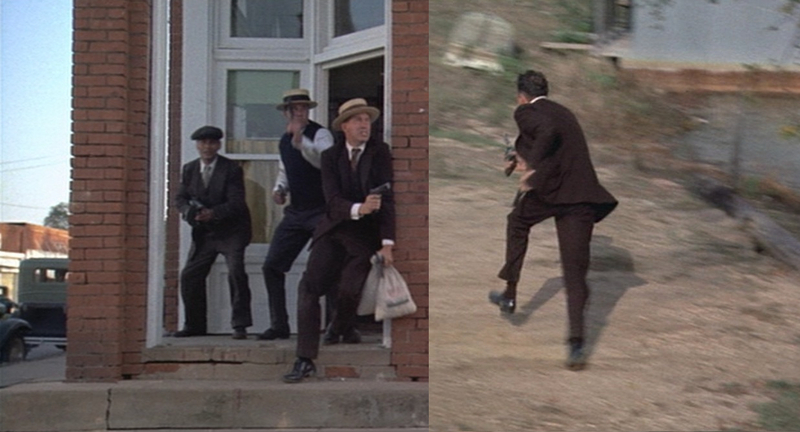 (Left) Dillinger fires his pistol until it runs empty during a bank robbery getaway. A dead vigilante landed on the top of his ’35 Ford, somehow avoiding the The Untouchables effect. (Right) A somewhat calmer moment. While bank robbery isn’t a recommended profession, Dillinger’s approach can be appreciated. As leader of the gang, he certainly isn’t lazy. He’s out in the front with his guys, trading shots with the cops in just as much danger as the rest of them. When things get tough and someone needs to drive the car, he leaps in and takes charge. After a young gang member (not even important enough to be named on screen!) is fatally wounded in the belly, Dillinger stands over his bed, talking the psychotic “Baby Face” Nelson down from killing him. Up close, it looks like Dillinger and Billie are having a tender moment. The full scene makes it looks like he’s about to cap her knee. Wisely, given his profession, Dillinger was well-armed both in film and fact. The real life Dillinger’s preferred weapon was the venerable Colt M1911A1 semi-automatic pistol chambered in either .45 ACP or, once Dillinger knew a guy who knew a guy, the new and powerful .38 Super round, developed in part to help police battle the growing crime wave and now a common round in IPSC competitions. Naturally, since this film was made in 1973, Dillinger followed the example of its peers and used a 9 mm Star Model B to stand in for the less blank-reliable .45-caliber M1911 pistol. 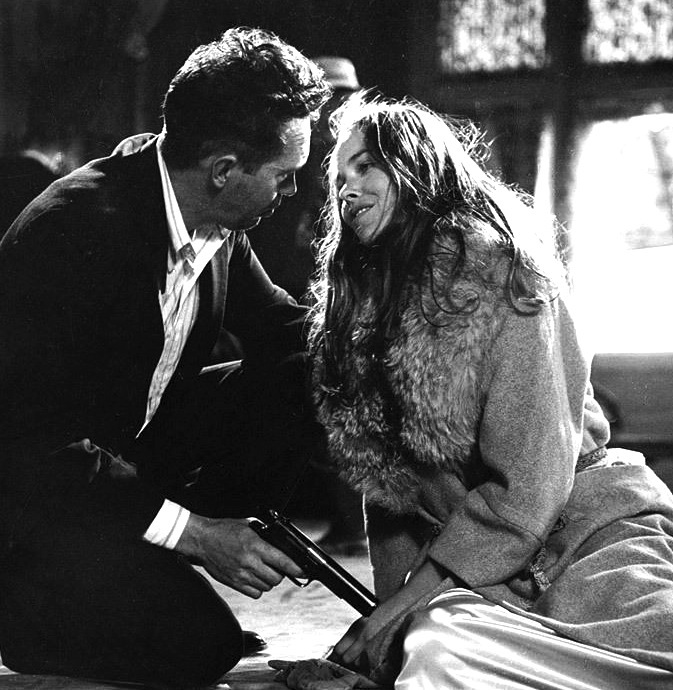 This blog has discussed the Star 9mm-M1911 film relationship ad nauseam. However, it’s worth mentioning again here as Dillinger uses his two pistols during the bank robbery and subsequent getaway. 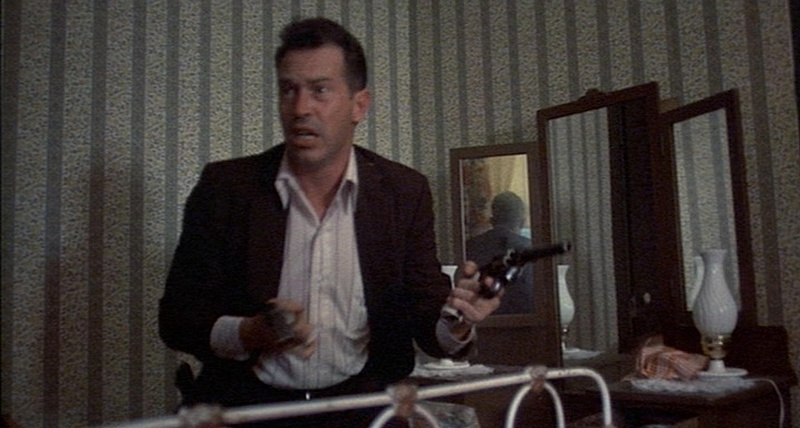 Of course, whether it’s a continuity error or John Milius liking the idea of Dillinger being a four-gun guy, Dillinger also carries a pair of Colt New Service revolvers during the Little Bohemia getaway. Constructed of tarnished blue steel with ivory grips, they appear to be the exact same pair of New Services carried by Reed Youngblood during the Mason City robbery the previous day. 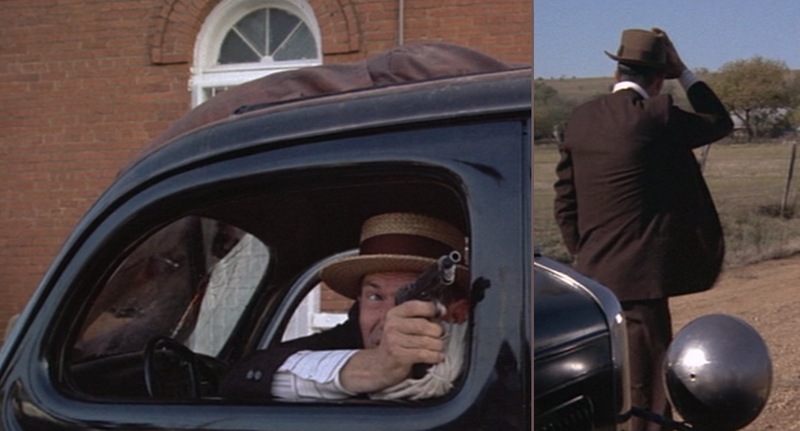 However, we see Dillinger cross over Youngblood’s corpse and etner the car without picking up the two revolvers. Continuity eror? Probably. But Milius, who provided the basis for John Goodman’s gun-toting character in The Big Lebowski, probably also wanted Dillinger to be the kind of guy who carried four guns. 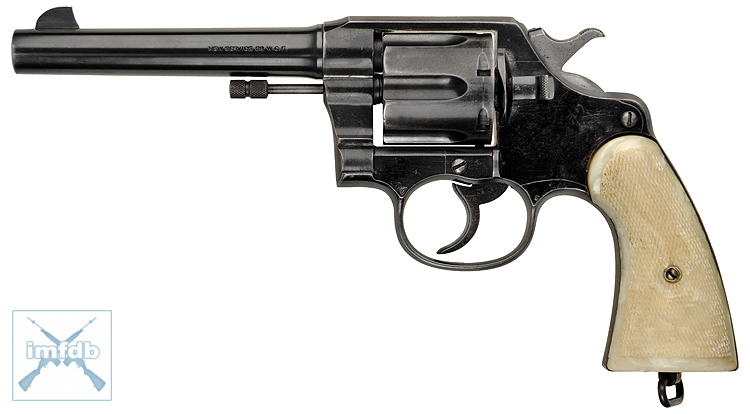 The New Service was a heavy duty double action revolver introduced by Colt in 1898. This powerful revolver was produced for nearly fifty years in a variety of sizes and calibers from .38 Special to the big British .476 Eley round. The most common models were the .45-caliber, produced in .45 Colt (Model of 1909) and .45 ACP (Model of 1917). The M1917 was an interesting revolver as it was adapted to fire the rimless .45 ACP semi-automatic rounds with the use of half-moon clips. 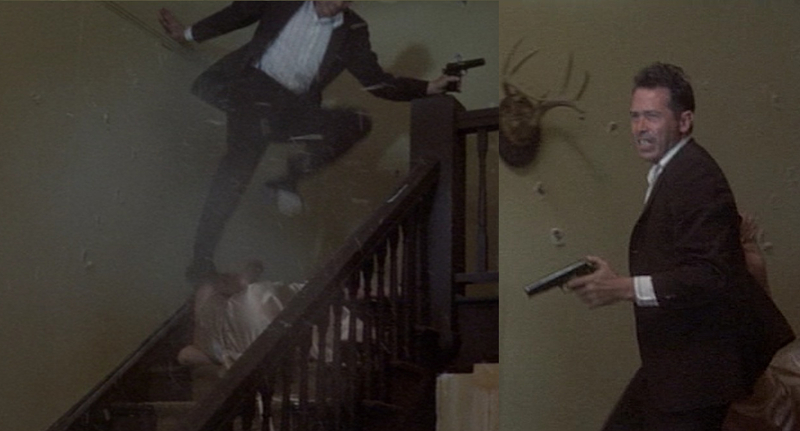 While seeing M1917-armed characters in films actually utilizing the clips is rare, the appearance of M1917s is not. A beautiful Colt New Service, this one chambered in .38-40, as seen on IMFDB, a terrific resource for both firearm and movie fans. The M1917 was only made for three years, discontinued in 1920 after 150,000 were produced by Colt. Smith & Wesson produced an additional 150,000 during the period. 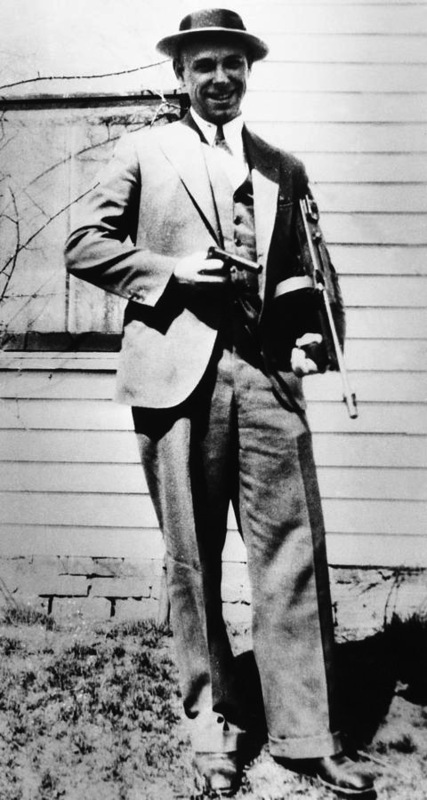 Devoid of holsters, Dillinger keeps his two revolvers in the hip pockets of his jacket, drawing them simultaneously when the FBI begins their barrage. Before making his final escape, Dillinger gets his girlfriend to cover him from a window. (He would’ve taken her with him, but she sprained her ankle on the stairs.) She dramatically screams “Run!” while covering his escape with a Thompson submachine gun that, by the miracle of continuity errors, becomes a Browning Automatic Rifle. 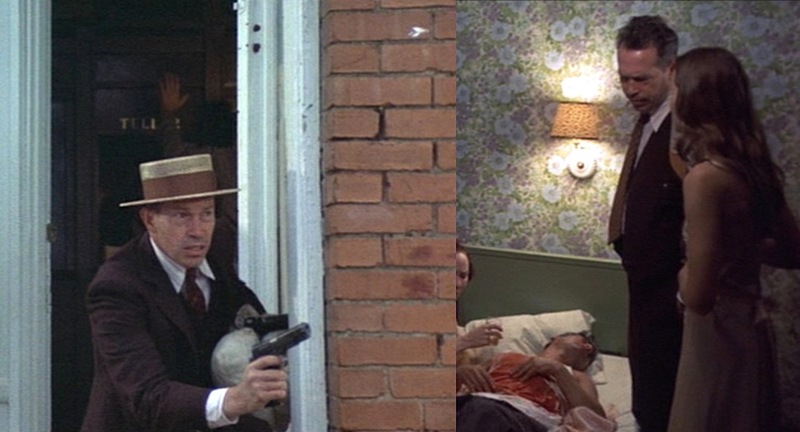 Billie’s gun changes from a Thompson (left) to a BAR (right) while she covers Dillinger’s escape from Little Bohemia. 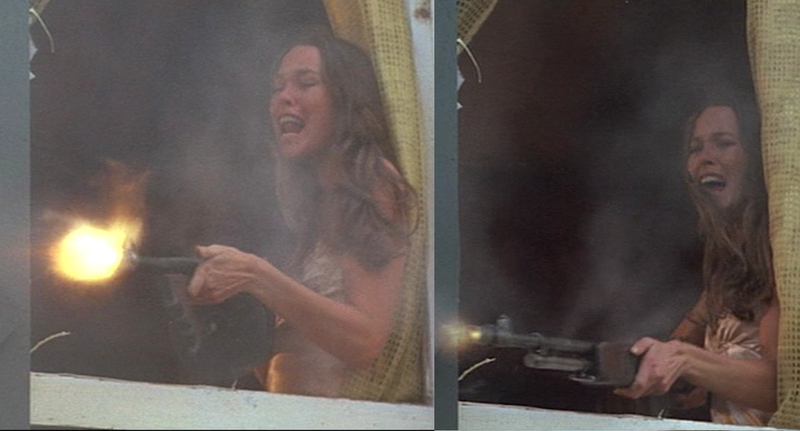 I don’t care about the continuity error, I just think it’s awesome seeing the waiflike Michelle Phillips from The Mamas and the Papas blasting away with an automatic weapon. Buy the movie. Also, why not visit the real Little Bohemia? You can grab a delicious meal and the place is proud of its link to Dillinger, who “only left because he had to,” according to the website. They won’t ever get me. I may not live forever, but I’d be a damn fool not to try! Thanks, Neal! Sorry, I’ve been meaning to respond to this and I thought I had. How did you get your hands on one of those pistols?? If you have pictures up anywhere, I would love to see. I’ve had a long personal side project of trying to track down as much information as possible about the weaponry used by Dillinger, Floyd, Nelson, etc. Luckily, some of the information is VERY well-documented in FBI reports. http://historicalgmen.squarespace.com/ is a great site with a lot of links to related FBI reports, including interviews with San Antonio arms dealer H.S. Lebman, who had modified a few .38 Supers for the gang. Glad to see your comments and keep enjoying!